State, local, and federal government agencies manage a tremendous amount of records, media, libraries, firearms, evidence, data, and supplies. Business Systems & Consultants offers a variety of government procurement vehicles and have extensive experience in law enforcement, healthcare, public safety, education, and administrative operations. To make life easier, we have storage solutions that can configure nicely to fit older government buildings. We are experienced in working with government procurement and purchasing processes for all government positions. Ask our team of government experts to show you what we have done to innovate government information and material handling and storage. We have solutions for law enforcement, healthcare, military, public safety, K-12 and higher education, Court Systems, Housing Authority, Department of Health and Human Services, Human Resources, and archives. No matter what division of government you work in, paperwork and documentation are an inevitable part of the job, even as we move more and more toward electronic record keeping methods. As a result, that means document storage systems are also critical because they help you organize, store, and safeguard important records. At BSC, we’ve worked with many different government departments over our 40-year history, and we know exactly what types of solutions you need to manage and store your files. Helpful products include durable and reliable filing cabinets, space-saving vertical and modular filing systems, carousel-style filing and storage systems to keep your documents well-organized and accessible, shelving, bookcases and cabinets in a variety of styles and sizes, and more. Government agencies and departments, like all organizations, could always benefit from additional space, and we also have storage solutions that can help you achieve that. And the best part about these systems is that they allow you to maximize and optimize your existing space, meaning you get more functional area without having to expand into a larger and potentially more expensive facility. 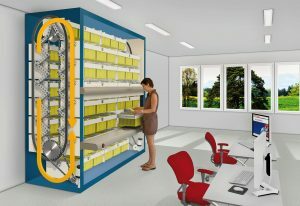 The products that are best-suited to space-saving endeavors include the Hänel Rotomat and Lean-Lift, which are both vertical storage and organizational systems that can help you gain as much as 60% more space. Another option is mobile storage units, which can be moved and condensed with ease to reduce the footprint required for your storage area. BSC has been working with government agencies and organizations for many years, and we understand the unique material handling and storage challenges you face. Our comprehensive product line includes everything you might need to improve organization, management, and safeguarding of your important documents and materials, including filing systems, storage solutions, shelving and racking, fire suppression systems, and even high-tech tracking technologies that will help you keep track of sensitive documents, patient records, assets, and more. For more information about our storage solutions, material handling systems, organizational tools, and tracking and management technologies, contact BSC today. We can even give you with a free assessment and quote so you can get your project started right away.